Built 1911-1913 for the "Konzerthaus-Gesellschaft" and the Austrian Interior Ministery by Ferdinand Fellner & Hermann Helmer. 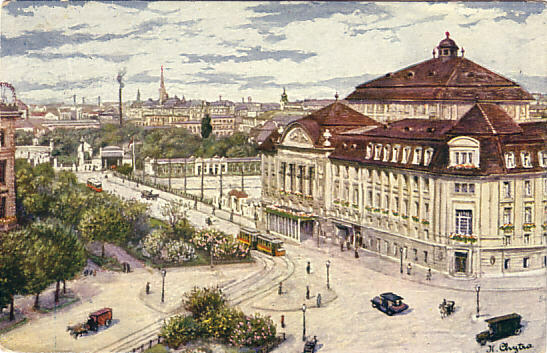 The complex comprises two completely separate buildings: the "Konzerthaus" concert hall, and the "K. k. Akademie für Musik und darstellende Kunst" (Royal Aacademy of Music and Performing Arts). Akademie: Designed for 1000 students. 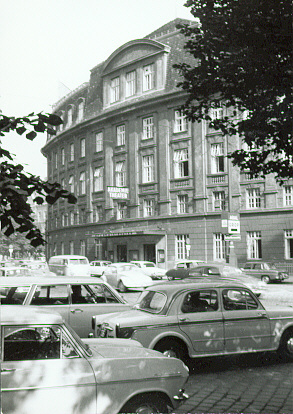 The building includes the "Akademietheater" (521 seats). Opened 4 Feb 1914 with Verdi's opera "Un ballo in maschera". Since 1922, used by the Burgtheater company. 1939 and 1975 interior rebuildings. 500 seats (+ 32 standing). Front Text: signed: "K. Chytra"
Handwritten Reverse Text: "Wien, Akademietheater, September 1965"